You said “Yes,” so now what’s next? 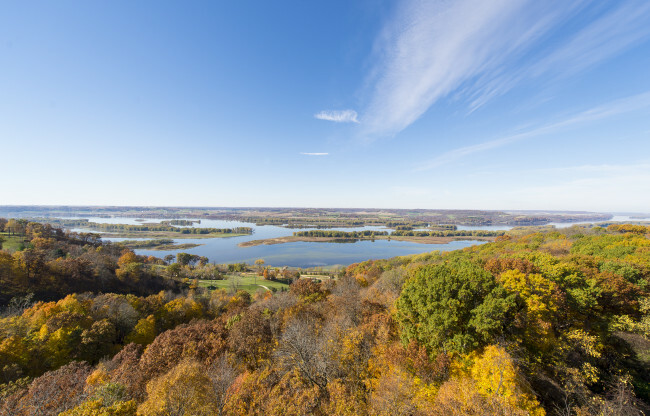 Don’t stress, because located high above the Mississippi River, Chestnut Mountain provides three gorgeous wedding venues. Whether you choose The Vista, Grandview Pointe or the Sunset Gardens, we promise you won’t have anything but a picture-perfect wedding. From the linens to the cake and everything in-between, Chestnut’s expert staff is ready to assist with your wedding details, including menu selections, to ensure a successful event. 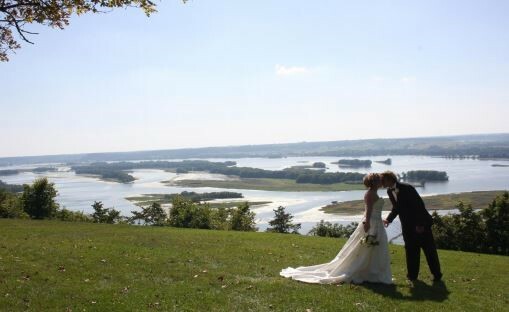 At Chestnut Mountain Resort, there are two locations for an outdoor ceremony: Grand View Pointe and Sunset Gardens. Your wedding ceremony at Chestnut includes white folding chairs set-up to the bridal couple’s specifications, wedding arch/trellis, tables for the unity candle, guest book, electrical service, discreet portable restrooms (at the Grand View Pointe), a portable sound system, and an incredible view. 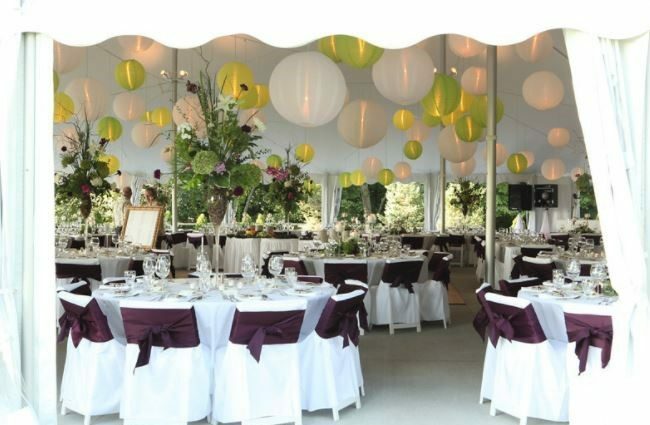 As we understand the importance of your special day, your site fee guarantees that even if your wedding day weather isn’t as perfect as you would have hoped, you will have the option of an inside banquet room for your ceremony. Once your vows are exchanged, it’s time to celebrate! Following the ceremony, you will have the option to take your guests inside to the Vista (our indoor wedding venue) or keep the party going outside in our Sunset Garden tent venue. The Sunset Gardens reception includes 60 x 70-foot white, high peak tent with cathedral window side panels, an 18 x 18-foot parquet dance floor, 66-inch round guest tables and white padded folding chairs, banquet tables and skirting, cake tables, banquet food set-up, display lighting and electrical hook-up, white Chinese lanterns, and a DJ. The Vista reception room is our inside venue that can accommodate up to 200 guests. The Vista room package includes a complete room set-up, white or ivory table linens, china silverware, glassware, and discounted hotel accommodations for your guests. 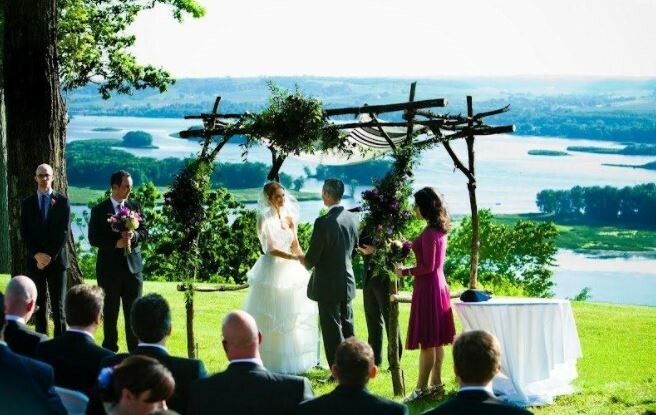 If you chose to hold an outdoor ceremony prior to the reception you may choose either the Sunset Gardens or the Grand View Pointe. Additional enhancements, such as a champagne fountain or specialty linens, can be added upon request. visit the Weddings & Meetings tab located right here on our website!